Will you get diseases or fungi in the substrates that will effect plant growth? We have not experienced any diseases or fungi in alternative substrates that are not also found in standard pine bark supplies. You may notice slight areas of discoloration on the substrate surface of lighter-colored materials that have been amended with Micromax. This is not fungi, just the micronutrients being released. We have not noticed it before due to the dark coloring of standard pine bark- and peat-based substrates. Will wood-based and and other alternative substrates tie up nitrogen (N)? We are studying nitrogen (N) dynamics in the alternative substrates. One of the initial concerns with all alternative substrates was N immobilization. As these substrates are probably more easily decomposed than pine or Douglas fir bark, they are also more likely to immobilize N to aid in the decomposition process. 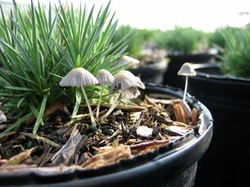 We have observed slow initial growth of some plants in alternative substrates compared to pine bark, however, after 6 to 8 weeks plants in alternative substrates had ‘caught up’ and outperform those in pine bark. We attribute this to temporary immobilization and subsequent release of N in alternative substrate materials. 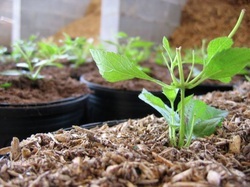 To eliminate the initial stunting of crops in alternative substrates, we are evaluating fertilizer application techniques that would turn this phenomena from a disadvantage to an advantage. How do I get these materials to try in my nursery? Most of these materials are still in the trial research phase and are not readily available via standard substrate supply routes. 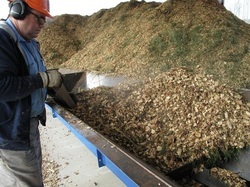 It is our hope that, with additional research, pine bark suppliers will begin to carry alternative substrates. If you would like to invest in processing alternative substrates at your nursery you will need a hammer mill with several screen sizes to choose from. These machines come in many sizes to accommodate the goals of your alternative substrates program. Other potting equipment such as soil mixers and potting machines should work similarly to your current materials with minor adjustments.